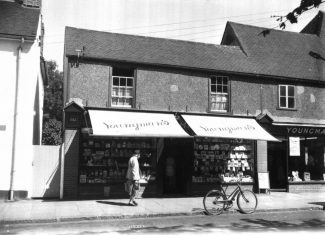 I lived next door to Youngman’s shop. Dorothy gave me a Saturday job and woe betide you if you sampled the sweets!! Reg also ran a printing business. I was in the same class as Susan Odell and Terrence Lockhart. I use to sit next to Stuart Blackie and I clearly remember the day of the 11 plus results. Tom Edwards was concerned that Terence should not feel left out. My mother Nayda Affleck was a staff nurse in Casualty and I am still in touch with Jenny Simpson whose mother was Captain of the Girls Brigade. My mother Marjorie Joan Jarvis was born in No. 132 in 1920. Her parents Arthur and Annie Jarvis took over the shop sometime between 1911 and 1914, Arthur previously being recorded as the landlord of the Wheatsheaf in Burstead in the 1911 census. Arthur served in the Army from 1914 to 1919 and died in 1938 but his wife Annie retained the shop until it was taken over by the Youngman’s. Marjorie had two older sisters Annie born in 1910 and Edith born in 1911.